Like any good tribute, it’s a little bit of hyperbole—Dal was hardly seen as just a “small college” in the immediate pre-Hicks era—laced with a lot of truth. Hicks’s 17-year presidency (1963-1980) coincided with perhaps the single most transformative period in Dalhousie’s history. Student enrolment more than tripled. The size of the physical campus increased eight-fold. And from labour relations to scholarships and research funding, many of the defining features of the modern university took shape. The man who was at Dalhousie’s helm through that transformation had previously been Nova Scotia’s first minister of education, and subsequently premier and leader of the Liberal Party of Nova Scotia. Born in Bridgetown, NS, Hicks studied Science at Dal before becoming one of the university’s 89 Rhodes Scholars, taking off to Oxford to complete a Law degree. He’d return to England during the Second World War as a Captain in the Royal Canadian Artillery and, following the war, was elected to the Nova Scotia Legislature, serving the people of Annapolis Royal for 25 years. Hicks’s time as premier was short (barely two years) as he was unable to unite his party to defeat an ascendant Robert Stanfield and the Progressive Conservatives. 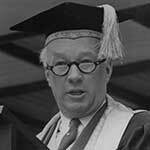 After a second loss to Stanfield in 1960, Hicks was set on practising law until Dalhousie called, offering him the deanship of arts and sciences and, in short order, the position of vice-president academic. Unspoken, but understood, was that Hicks was likely a leading candidate for president when Alexander Kerr’s time was through. The Hicks era proper began a mere three years later. It was a time when the baby boom was making its way into higher education, and universities across Canada were feeling the shockwaves; at Dal alone, enrolment was rising an average of 13 per cent each year. Hicks threw himself into the task of raising funds to support a growing campus. The Killam Library, Life Sciences Centre, Tupper Medical Building, Weldon Law Building, Student Union Building, Dalhousie Arts Centre, Dalplex — all were fundraised for and built under Hicks’s watch. It wasn’t just buildings, either: Dalhousie created the Transition Year Program, adopted the Maritime School of Social Work and received the Killam Trusts to support graduate students. Hicks’s extracurricular activities—like serving as president of UNESCO (1964-68) and in the Canadian Senate (1972-1990)—frequently took him away from campus, and his era was not without its controversies, especially towards the end of the 1970s as funding deficits together with labour and neighbour disputes foretold a more challenging decade ahead for Dal. But the era also pushed Dalhousie from a regional university into a national force, setting it on a path to becoming the leading research university it is today. It’s both fitting and ironic, then, that the Arts and Administration Building was dedicated in Hicks’s honour in 2002 — ironic, because it’s one of a handful of buildings on campus that wasn’t built under his watch; fitting because it’s where Dal’s current administrators continue to push forward in building the university’s future.